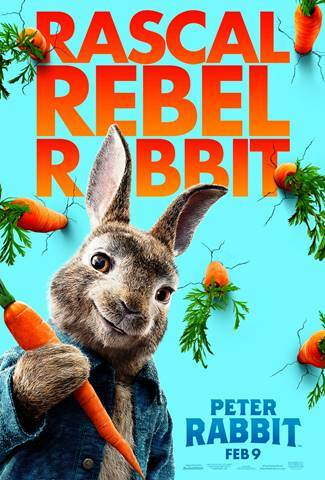 Peter Rabbit is the live action adaptation of Beatrix Potter’s Peter Rabbit books. The movie was funny in parts, but seemed to try just a little too hard to get laughs. My kids (13yo & 8yo) enjoyed the movie and laughed the whole time; however, I felt that it was trying to hard to get a laugh. The story was cute, but the movie was just okay. The CGI was great and live-action actor Rose Byrne (as neighbor Bea) was sweet and charming. This is one that’s made for the kids! They will love it. The movie gets the PG rating for rude humor and action. There is a death on screening and the some sadness when the rabbits’ burrow is blown up. There is no stinger at the end of the credits, but there are extra scenes/cartoons during the first part of the credits. Peter Rabbit opens nationwide Friday (2/9). There is a stinger during or after the credits….so don’t leave!